There’s something special about the New Orleans, Louisiana metal scene. By the obvious Pantera association I was captivated by Down’s legendary debut, but it was a pivotal moment hanging out at a buddy’s place where I first heard the disturbed genre-bending brilliance of Acid Bath that my infatuation with the NOLA metal scene took off. Eventually this lead me to various other notable acts such as the brilliant Soilent Green and despairing sludge woes of Crowbar and Eyehategod. Some 20 years ago, several prominent scene members activated Goatwhore and a new beast and underground supergroup was born, most notably featuring Acid Bath/Crowbar axeslinger Sammy Duet and Soilent Green frontman Ben Falgoust. 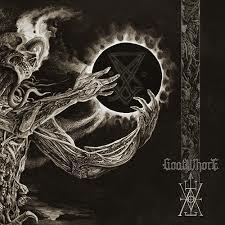 It took a while before Goatwhore perfected their blasphemous style of sludgy, death-infused black metal, striking pay-dirt with the back-to-back punch of 2006’s A Haunting Curse and 2009’s Carving Out the Eyes of God. Since then they’ve been treading water with a couple of solid but less engaging albums, lacking the staying power of their best work. Now Goatwhore return with their seventh album of horn-throwing fury, entitled Vengeful Ascension. 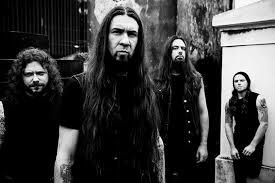 Musically Goatwhore traverses similar terrain to their past few albums, infusing their muscular black metal with punk, death, thrash and sludgy Southern metal, maintaining their trademark violent energy, musical potency and attitude. Robust opener “Forsaken” features a reliably powerful vocal from Falgoust, using his multi-toned growl to full effect, while the pounding drums hammer away underneath the rugged riffs and malevolent melodies of Duet’s guitar. It’s a fairly stock standard beginning, comfortably slipping you back into that fun and ferocious Goatwhore groove. A couple of solid songs blaze by, including the title track, which rides a sludgy, mid-paced groove, anchored by Duet’s infectious riffs and interesting harmonies. However, Vengeful Ascension doesn’t really kick into high gear until the aptly titled fourth track “Chaos Arcane” rips forth with reckless abandon, a thrashy blackened spitfire of tightly focused aggression and exhilarating speed that gives the album a shot in the arm. The seasoned line-up all pull their weight well, with the rhythm section of drummer Zack Simmons and bassist James Harvey powering away with sledgehammer force and precision. Credit must go to Duet for another solid all round performance, confirming his status as one of the true warriors of the NOLA metal scene and an underrated guitarist at large. He’s particularly versatile without being an overly flashy or technical player, expertly pulling strands from various extreme metal genres and forging it into his own unique and distinctive style. And even when the songs aren’t at their most distinguishable, Duet’s catchy riffcraft provides consistently solid entertainment value, especially when complimented by the occasional old school shredding solo. His burly and infectious work on the wickedly savage “Mankind Will Have No Mercy” is particularly noteworthy. Vengeful Ascension is pulled together with a stout, reasonably dynamic production matched up with a suitably beefy guitar tone. This is yet another enjoyable, catchy and barnstorming Goatwhore album, baring enough memorable riffs, raw savagery and variety to remain engaging across its efficient duration. Overall, the album is an improvement over Constricting the Rage of the Merciless and sits somewhere in the middle-to-upper tier of the band’s now extensive canon. Vengeful Ascension is an ideal soundtrack for engaging in mischievous mayhem or simply knocking back some brews with good company, and that folks, is what Goatwhore is all about.